This post has been updated to note that USNI News reached out to the Department of Justice for comment prior to publication of this story. Additionally, an attorney representing Leonard Francis provided comment following publication of an earlier version of this story. WASHINGTON, D.C. – The investigation into the web of corruption spun by contractor Leonard Francis has wreaked havoc on the Navy’s ability to fill senior leadership roles, unintentionally stalled hundreds of officers’ careers and thinned out the service’s flag ranks, USNI News has learned. 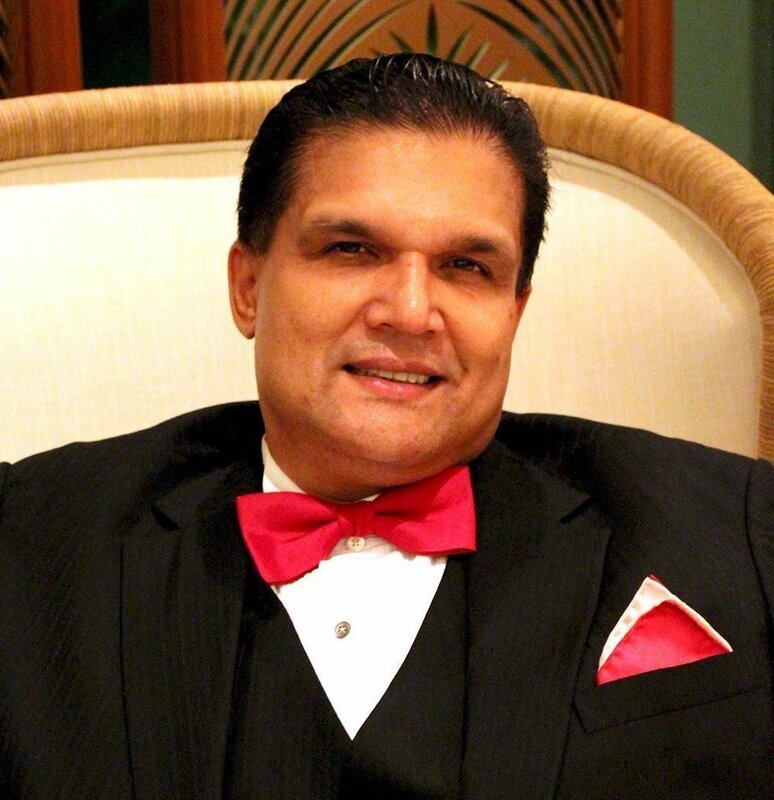 The six-year-long Department of Justice-led probe into the “Fat Leonard” scandal has resulted in 33 federal indictments, 22 guilty pleas and Francis admitting to authorities that his company, Glenn Defense Marine Asia, had overbilled the Navy by $35 million to support port visits by U.S. warships. But to get to that total, hundreds of personnel that served in the Pacific who had not committed any crimes had to be investigated and then cleared. That process placed a countless number of officers on hold with no information on their status and no timeline for being freed from suspicion – a process that sometimes took years – former Secretary of the Navy Ray Mabus told USNI News in an interview last year. The sheer volume of Navy personnel exposed to Francis is indicative of how ubiquitous GDMA’s reach was in the Western Pacific from the late 1990s to his 2013 arrest. The Japan-based U.S. 7th Fleet relied heavily on GDMA to carve out places where U.S. warships could make port calls as Washington wrestled with Beijing for influence in the South China Sea, several officers who served in 7th Fleet have told USNI News. China was at the time seen as the U.S. Navy’s greatest adversary, and therefore the best and brightest officers in the service cycled through deployments in 7th Fleet. Many of those same officers’ promotions were later put on hold while the investigation was ongoing, with the effects rippling up to the highest levels of the service. While the total number of Navy personnel DoJ has under investigation is unknown, as of early 2018 Justice had passed to the Navy almost 450 names that they elected not to prosecute. Of those, the Navy elected to take a handful to court-martial, issue seven letters of censure from the Secretary of the Navy, and issue about 40 other administrative actions. As of early 2018, there were about 170 names still pending before the CDA. Several senior officials over the last several months have told USNI News that the damage done to Navy leadership was worse than the aftermath of the 1991 Tailhook convention scandal. A spokesperson from the U.S. District Court for the Southern District of California declined to comment on the investigation when reached by USNI News earlier this month. Beyond the well-documented dinners and wild parties, a major reason Francis was able to maintain relationships in the Western Pacific for so long was his near monopoly for ship husbanding in the region. Husbanding agents, like Francis, coordinated bringing the in-port ship fuel, water and food; removed sewage; and other miscellaneous logistical duties that included everything from setting up barriers for force protection to providing morale, welfare and recreation shuttles for sailors. His rise to prominence paralleled the maritime competition between the U.S. and China in the vicinity of the South China Sea in the early 2000s. The U.S. Pacific Fleet was on a campaign to put ships into places that they had never visited before and had to negotiate port visits to meet U.S. Navy standards for services. Those standards became much more complex following the 2000 suicide boat attack on USS Cole (DDG-67) in Yemen that killed 17 sailors. Francis was able to provide services to meet the tougher standards in places other husbanding contractors couldn’t, several officers who served in 7th Fleet told USNI News. Leonard’s catchphrase at GDMA was, “nothing is too good for the Fleet,” former Western Pacific Navy contracting official Bruno Wengrowski told USNI News in an interview. For former commanders who relied on Francis to keep their ships going, he made himself indispensable to 7th Fleet operators. From 2007 to 2009, retired Rear Adm. Mark Montgomery led the Japan-based Destroyer Squadron 15 that operated almost exclusively in 7th Fleet. Out of 100 or so port visits with his destroyers in that period, GDMA provided husbanding support for about three-quarters of those visits, he said. “[Francis] was an aggressive husbanding agent who supported our ships, made sure they got what they wanted. Clearly with a profit motive. But as an operator, it was nice to have someone pushing hard to get things,” Montgomery told USNI News in a mid-December interview in Washington. In addition to controlling an abundance of ports, GDMA had a knack for solving tough problems for the Navy that made him essential to the service in the Pacific. 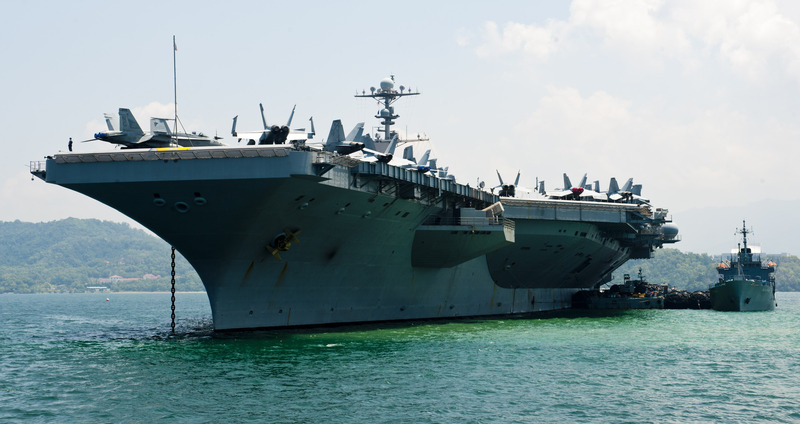 For example, in 2007 carrier USS Nimitz (CVN-68) was set to undertake a complex port visit to Chennai, India, as part of a broader U.S. effort to tighten ties with New Delhi as China continued to expand its influence in the Indian Ocean. “No other husbanding agent would sign up to get all the facilities, all the services present, to the standard required by the Navy in India, and he did it,” Montgomery said. In another poke at China, in 2012 Francis was able to meet Navy standards for a carrier to pay a call to the Malaysian port of Kota Kinabalu on the edge of the South China Sea. GDMA had a profit motive to steer the 7th Fleet staff to the port it controlled to overbill the Navy for services. But Francis was also savvy enough to know that the Navy would see the visit by USS John C. Stennis (CVN-74) at the edge of China’s territorial claims as a strategic win that benefited U.S. foreign policy in the region. “He was a crook, but he was our crook,” Cmdr. Mike Misiewicz, former 7th Fleet deputy of fleet operations and now convicted felon for his role in the scandal, told Defense News in 2016. In a statement provided to USNI News on Friday following the initial publication of this story, Francis’ attorney, Devin Burstein, said the investigation has highlighted a “dichotomy” in the relationship between 7th Fleet and GDMA. 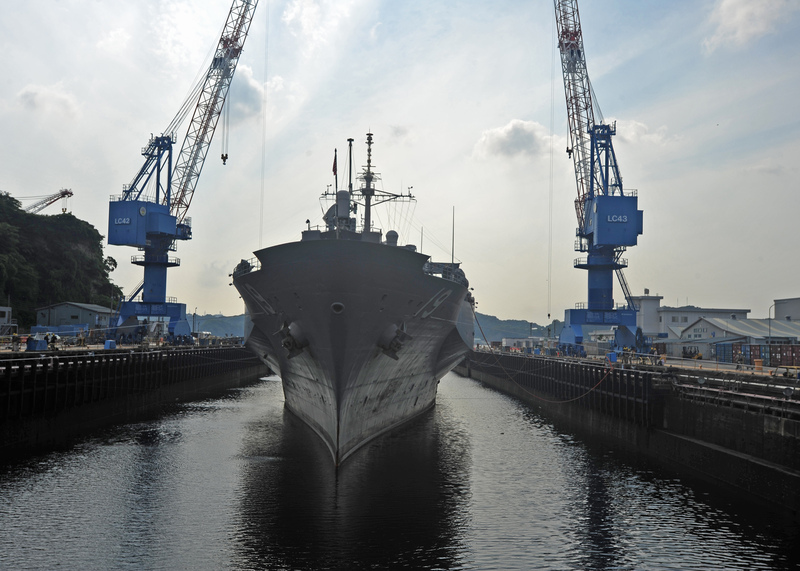 U.S. 7th Fleet flagship USS Blue Ridge (LCC 19) pulls into Dry Dock 6 at Naval Ship Repair Facility and Japan Regional Maintenance Center (SRF JRMC) Yokosuka on June 1, 2016. US Navy photo. 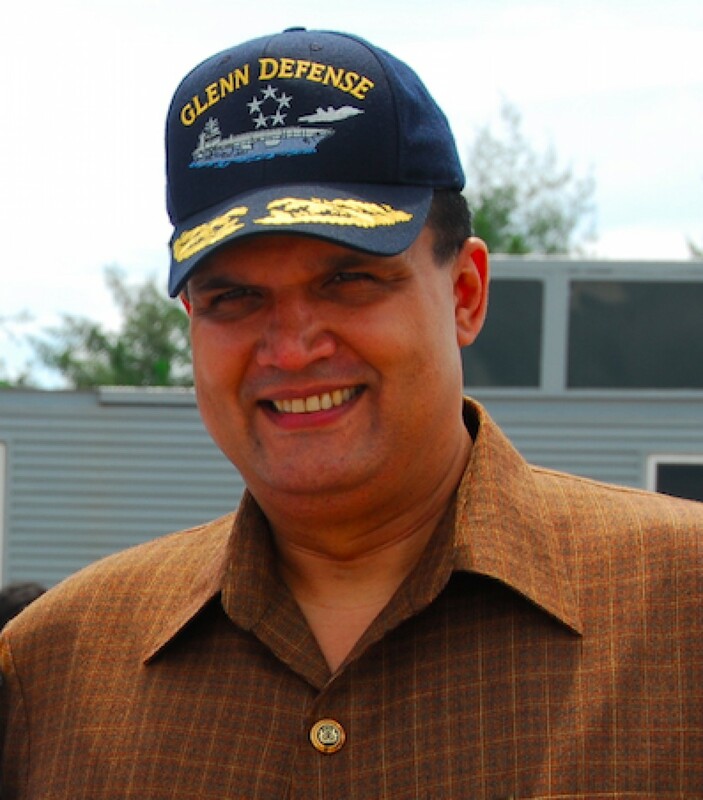 The fallout from the Fat Leonard investigation has been so devastating to the Navy, in part, because the scope of those under suspicion is so broad, Bryan Clark, a naval analyst at the Center for Strategic and Budgetary Assessments and former aide to retired former 7th Fleet commander and Chief of Naval Operations Adm. Jonathan Greenert, told USNI News in a January interview. Combined with the staff of 7th Fleet and other Pacific Fleet jobs ashore, the number of Navy personnel that had business with Francis – or at least attended an event he sponsored – numbered in the hundreds. “Because you’re talking about more than a decade, two decades almost, that’s a lot of people that you got to now put under the microscope to ensure that they were not involved in any of the wrongdoing,” Clark said. As of the start of 2018, about 450 cases were forwarded from DoJ to a consolidated disposition authority (CDA) appointed by the Navy in 2014 to determine if individuals warranted additional punishment from the service. 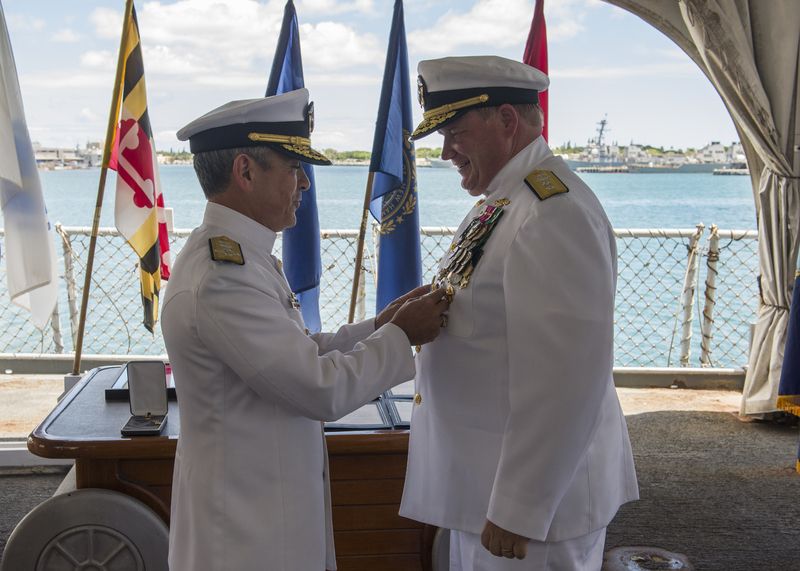 Since 2014 there have been three different CDAs: Adm. John Richardson when he was director of naval reactors until he became CNO in 2015; former U.S. Fleet Forces Command commander Adm. Phil Davidson, from 2015 until he took command of Indo-Pacific Command in 2018; and current Fleet Forces commander Adm. Christopher Grady. From those cases, the Navy has elected to court-martial a handful of active sailors, issue an unknown number of non-judicial punishments for others and mete out other administrative actions like non-punitive letters of caution (NPLOC) and censures for those who have left the service. As of early 2018, the Navy elected to take administrative action for about 40 of the names handed over from DoJ, USNI News has learned. But aside from those who faced punishment from the Navy, many of the best officers in the Navy were neither punished nor cleared in a timely manner, meaning they were unable to advance to more senior leadership positions in the service. Under federal law, there’s a limit to how long an officer can serve before they’re either promoted or moved out of the service. Timing is key to the official and unofficial grooming for flag ranks, and the promotion holds for officers named in the investigation began to breakdown the process. “A lot of your hot runners were coming out of that theater, which meant a lot of your hot runners that were in line for these milestones were the very people that had been potentially implicated in this investigation,” Clark said. Several officials familiar with the investigation said that subjects often didn’t know they were under suspicion until they tried to move into new jobs or promote. Officers who were waiting for their next promotion could be on hold for years without knowing the status of their investigation. Rather than cope with the anxiety of not knowing their future in the service, many opted to retire instead of serve. Adding another roadblock, until recently the Navy had difficulty complying with U.S. Senate rules on disclosing potentially prejudicial information for a nominee for a three-star position due to Department of Justice restrictions. “If there’s been an [inspector general investigation] on somebody, any kind of administrative action, that’s already documented. And so you’d lay that forward. But the sticking point here is, just because somebody’s name came up in a conversation, may that be a deposition, or an interview, or in Mr. Francis’ email, or anything else. These names have tended to build up,” a retired senior Navy officer told USNI News in an interview. Initially, even the scope of those who might be implicated was unknown to senior leaders in the Navy because they themselves hadn’t been cleared of impropriety in the investigation. Much of the collateral damage to the service has come from how to handle the gray area between criminal behavior and a violation of Navy rules and procedures. Defining wrongdoing for those caught up in the case has been met on a sliding scale based on circumstance and seniority, Clark told USNI. However, Clark said, there was still a question if ethical infractions were weighed differently because of their connection to the GDMA case. While junior officers who ran afoul ethical hurdles were given minimal punishment, according to a report in the San Diego Union-Tribune, the ethical lapses of senior leaders were dealt with differently. USNI News is familiar with the cases of several former Navy officials who were, as part of the CDA process, given a career-ending non-punitive letter of caution in their official record for violations like paying too little for a GDMA-sponsored dinner or accepting unsolicited gifts from Leonard. A NPLOC would not hinder the career of a more junior sailor, but circumstances are different for a more senior officer, USNI News understands. As senior captains move to rear admiral and one- and two-stars look to promote, any kind of detrimental mark on their reputation wouldn’t have been worth the risk to the service, several former senior officers have told USNI News. What added to the frustration for many caught in the ethical gray areas is that violations occurred when they were far more junior officers. He said, if those suspected of ethical violations had been punished as a more junior officer when the infraction first occurred, a non-punitive letter in their record wouldn’t have been stopped a career. But due to the length of the investigation, a letter from an infraction from years ago would be enough to end a career in the service for a more senior leader. In addition, the subjects of the NPLOCs and the public Secretary of the Navy Letters of Censure are limited in how they can dispute any allegations. In November, Montgomery was issued a letter of censure from Secretary of the Navy Richard V. Spencer – based on the recommendation of Grady, the current CDA – which accuses him of the crimes of graft and false official statements, charges that he categorically denies but can’t defend or appeal. “This was not an inspector general report. It was not a UCMJ report. It did not have the appropriate, from the evidence shown to me and the work product shown to me, it did not have the findings, the facts, findings, recommendations, and then the opportunity for me to review the evidence against me and to provide my rebuttal at that time as you would in a normal [inspector general] or UCMJ process,” Montgomery said. 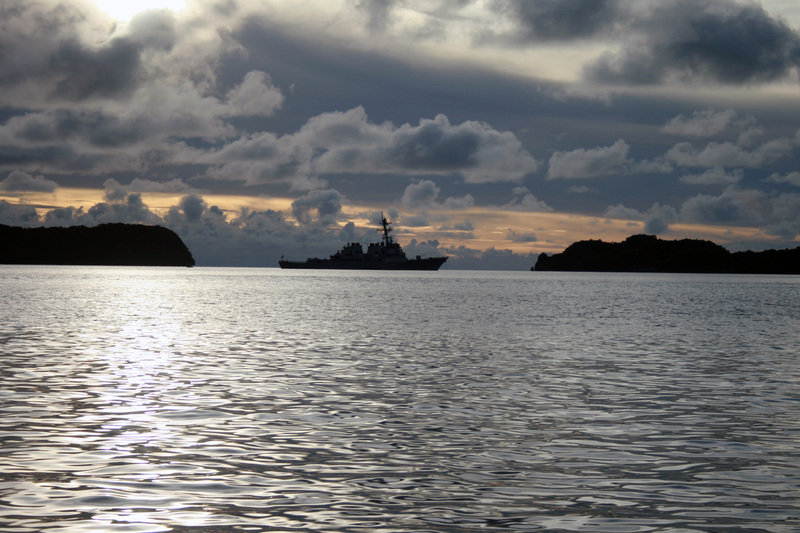 Beyond the Navy, the overall federal investigation shows no signs of stopping. In the beginning of 2018, Richardson told a group of reporters that he hoped the investigation would end by the close of 2018. However, that was not the case and there are no clear indications of the probe wrapping up soon. Former SECNAV Mabus said he believes the Navy successfully handled the situation on its own, and he places the bulk of the blame on the DoJ for taking too long. However, even if the investigation ended tomorrow, the damage the probe has done to potential leaders that were groomed in the Pacific to serve at the highest levels has already been done, a former senior naval officer told USNI News. “We started sending a lot of our best people out there – the commodores, air wing commanders, one-stars – and now look at what we’ve got,” the officer told USNI News.